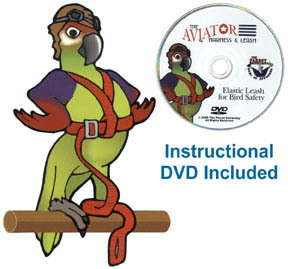 AVIATOR BIRD HARNESS (Large) is intended for birds weighing 600 - 1000 grams, such as: large Macaws, Triton Cockatoos, small Moluccan Cockatoos. Elastic leash cording reduces the total harness weight ... especially for small birds. Specially engineered collar hugs the neck keeping the strap from sliding toward the wing and annoying your pet. Special collar design is the only harness that allows birds to safely wear with food in their crop. Self-adjusting leash changes orientation as bird moves around handler. Automati9cally adjust from the chest to the back as the bird climbs and flies.